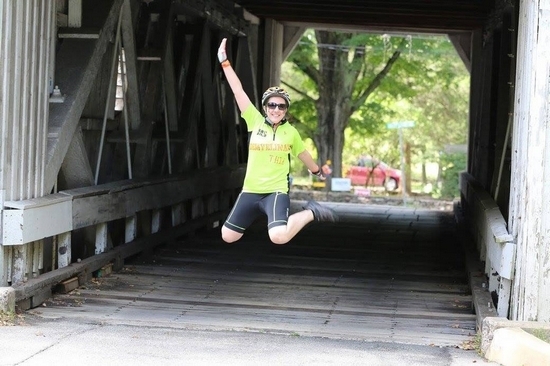 Lyndsay Wright jumps for joy at the "Barrels and Brews" 40-mile bike ride. Lyndsay Wright cannot be stopped. Despite being diagnosed with MS at 18, and originally unable to walk without difficulty, she’s participated in an MS walk and in the 40-mile “Barrels and Brews” charity bike ride to benefit Multiple Sclerosis research. “A lot of people said ‘You’re crazy,’ but I did it,” Wright said. “Barrels and Brews” was named for the Unionville Vineyard, which provided the start and finish for the race, and Saucony Creek Brewery, which provided refreshments afterwards. During the bike ride, Wright was filmed by HeathiNation, a national leader in health and wellness videos in the United States. They have a video series on their website called “True Champions,” which features patient advocates who are helping to make a difference for others in their community. The Emmy-Award-winning series aims to provide inspiration to the millions of individuals who live with, care for or know someone with MS. Wright will be in an upcoming video in the series. One of HealtiNation’s employees, Brendan Anderer, accompanied Wright on her ride; she was videotaped and had a ‘Go Pro’ camera attached to her bike. HealthiNation also did a follow up interview with her at the Cocktails for a Cure event in late September, which honored the ‘MS Stars’ - volunteers, sponsors, participants. Amazingly, Wright only started biking this past June, preparing for the event. Yet she knows she has to pace herself with MS. The Barrels and Brews bike ride was held in Ringoes, New Jersey, with the start and finish at the Unionville Vineyard. The route took the riders over rolling hills and the communities of Ringoes, Rosemont and Kingwood. The participants were grateful when police, positioned along the route, temporarily blocked traffic to let them pass. “Like (we were) celebrities!” Wright said. The event raised $64,000 for MS research. Wright and her small team of three others raised a little over $2,600. “We were really happy with that,” she said. Wright was the only one on her team with MS. Her bike was decked out in white and orange (MS colors) with ribbons and an engraved bell with the MS logo. “I’m dedicated, motivated and have love for the people who have to fight MS every day, like myself,” she added. The bike ride may have been grueling, but Wright was up to the challenge. When she finished, she, her three team members and the HealthiNation representative were all jubilant. "I actually cried. It was a very emotional finish for me. The people alongside me, even the guy from HealthiNation, said this is an incredible journey. When I was first diagnosed, I had trouble walking even and now that I rode 40 miles, it’s truly incredible and the emotions were just overwhelming when I crossed that finish line. It’s been quite a journey." Wright’s courage, determination and joy are an inspiration, not just for those with MS, but for everyone.